Nauticam RX-100 II Underwater Housing LOOK!!! This is a pre owned item it has seen little use and is in overall great working condition. Gemi Super Suit Uber Protection with Dive Housing GoPro HERO7 & HERO6 & HERO5. Experience New Places To Take Pictures. - see pics. Experience New Places To Take Pictures. Item is new and not been used. Reboxed from display - see pics. 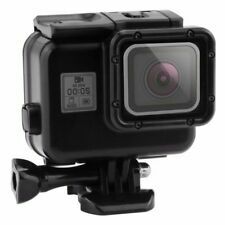 Underwater Housing fits to GoPro HERO5, GoPro HERO6 GoPro HERO7. Dive Housing (30m). 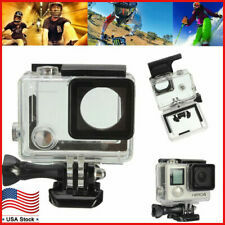 Underwater Housing fits to GoPro HERO5, GoPro HERO6 GoPro HERO7 Black Edition (it does NOT fit HERO7 Silver and White). Dive Housing (30m). thumb screw x 1. Olympus PT-058 UW-Gehäuse Neuware von Olympus Fachhändler. Die Schraubbefestigung ermöglicht die Befestigung von Unterwasserkonvertern. Auch Ankauf ganzer Sammlungen. Wasserdicht bis zu einem Druck entsprechend 45 m Tiefe. Passend für Zuiko Digital 2,0/50mm Macro Objektiv. Olympus PPO-E03. Die Dichtringe sollten aufgrund der Lagerzeit einmal erneuert werden. Sa 09:30 bis 15 Uhr. B-Ware vom Olympus Fachhändler. Es handelt sich hierbei um B-Ware von Olympus Deutschland. Nauticam 3,5" # 38702 N50 Wide Angle Dome Acrylic Port For Compact Housings. Ex. Nauticam underwater housing with two ports for these lenses. Port System N50. 52mm and it will not fit to Micro 4/3rd housings. Check the size before buy it. Port Material Acrylic. For E-M1 body, Fish-eye 8mm, Zoom 9-18mm, 60mm Macro and. CUSTODIA SUBAL ND70. CUSTODIA SUBACQUEA IN ALLUMINIO SUBAL ND70. SUBAL ND70 per NIKON D70 e D70s. SONO IMPOTATORE DIRETTO PER TUTTI I PRODOTTI SUBAL. NIKON D70e D70s. A CHI SI AGGIUDICHERA' L'OGGETTO POSSO FORNIRE QUALSIASI OBLO' E/O ACCESSORIO PER PERSONALIZZARE LA CUSTODIA. UWL-100 28AD Wide Conversion Lens. Lens Hood II for UWL-100 28AD. The Lens Hood specifically designed for UWL-100 28AD to shade unnecessary light from outside of view angle and reduce flare / ghost which could happen in backlit condition. GOPRO CASEY ABSSC-001 GOPRO AADIV-001 SUPER SUIT DIVING CASE HERO FIBER. GOPRO CASEY ABSSC-001 100% ORIGINAL GOPRO. Casey includes a pull-out pouch for smaller grab-and-go accessories like batteries, thumb screws, microSD cards, and more. Compatible with Nauticam mirrorless N85 system and the following. NIKKOR 10mm f/2.8 lens for the Nikon 1 System. Panasonic 8mm fisheye. Ultralight Strobe Adapter for Ikelite DS-161, DS-160, DS-125, DS-51, DS-50, MS, and MV Strobes. Condition is New - open box. The Fantasea FRX100 IV Housing for Sony RX100 III/IV is manufactured to the highest professional standards of function, style and durability. The Fantasea FRX100 IV Housing for Sony RX100 III/IV is ideal for outdoor and underwater photography. Vendo flash subacqueo. Mai allagato. cavo originale fibra ottica. Could fit to A6000 and A6500 as well. Free app for both Android and IOS available to download. Housing is made from anodized aluminum. CUSTODIA UNDERWAVE IGLOO PER NIKON F90 90X. PERFETTA SIA PER ESSERE USATA. Built with marine grade aluminum and marine grade brass with stainless steel hardware that allows full use of camcorder features to depths up to 330. Supplied with the Amphibico bayonet mounted wide-angle conversion lens and an external hydrophone to pick up the best sound underwater. The FG7X II Housing is manufactured to the highest professional standards of function, style and durability. The FG7X II Housing is ideal for outdoor and underwater photography. The FG7X II Housing was designed to be compatible with a complete accessory system, enabling photographers to enhance the quality of their images. All used and condition is unknown as it has not been used in years. Used many years ago with a Konica and it took incredible slides and photos. ALL IS IN NEW CONDITION AND I'VE BEEN TOLD THIS WAS A BACK UP KIT INCASE IT WAS NEEDED. (1) ADAPTER PLATE. The plate has two positions it can mounted in case. FROM THE LOOKS OF IT, IT WASN'T NEEDED. CUSTODIA SEACAM PER NIKON F100. PERFETTA SIA PER ESSERE USATA. solo l'impianto elettrico perfetto e il mirino costano il doppio del prezzo richiesto. Die beidseitig aufgebrachte AR-Beschichtung gegen Reflexionen minimiert Aberrationen und ermöglicht höchste Bildschärfe bis zu den Bildfeldrändern. PPO‑EP03 Unterwasser-Objektiv-Anschluss. Olympus PPO-EP03. Excellent condition includes Nauticam Vacuum system worth £200. Optional underwater strobes and arms. This housing. Get in touch if you need any advice. Seapro, underwater camcorder housing. I can't get it apart to check inside, but the bracket may be useful for an alternative torch. There are a few spare bulbs included in the sale, but not shown in the photos. This lens has been designed and developed exclusively for the Olympus TG-4/ PT-056 and TG-5/PT-058 combinations. Aggiuntivo wide 24 mm per custodia sealife DC 1200 ottimo stato completo di accessori. 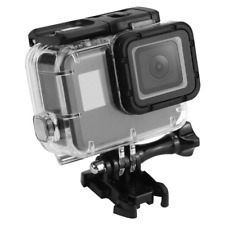 GOPRO AADIV-001 WATER PROOF HOUSING MULTIWAY BRACKET. XIT MULTIWAY 13 POSITION BRACKET FOR GOPRO. 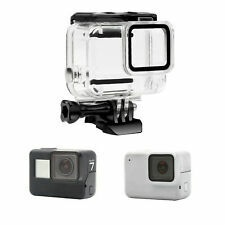 GOPRO AADIV-001 WATER PROOF HOUSING. GoPro AADIV-101 SUPER SUIT DIVING HOUSING. • Includes: Extension arm, grip, tripod & thumb screw. B-Ware vom Canon Fachhändler. Es sind minimale äußerliche Gebrauchsspuren erkennbar. Spritzwasserschutzgehäuse für Canon Legria mini. Auch Ankauf ganzer Sammlungen. Sa 09:30 bis 15 Uhr. La custodia FP7100 è stata progettata per essere compatibile con un sistema di accessori completo, consentendo ai fotografi di migliorare la qualità delle loro immagini. Attacco speciale per accessori di illuminazione. Anti-reflection window glass. Fitting Sheet. User Manual. Quick Setup Guide. Black Foam Pad. Round Type Cushion. Fish Tail Type Cushion. Athena Doppelgriff M1. Zustand : gebraucht. Brand new. Seal packaging as shown in picture. The WP-DC28 Underwater Case has been specifically designed for the Canon PowerShot G10 Digital Camera and is waterproof down to the depth of 130 ft. (40m). This clear and durable polycarbonate case shields your digital camera as you explore your underwater surroundings. A tight O-ring main seal with safety lock, along with stainless steel and nickel-plated brass hardware, help to ensure protection from corrosion for years to come. A fluorite (FL) glass window gives your digital camera's high quality Canon lens the protection and clear view it needs to deliver crisp detail and vibrant color. A flash diffusion plate allows you to use your camera's internal flash. Sea & Sea Acrylic Wide Angle Lens Dome Port With Custom Zoom Gear. Hard To Find. Hard To Find. There is a zoom or focus gear on the side of the port, which very convenient and very hard to find. I didn't find any numbers on it. Just says Sea & Sea. not for fish-eye lens, just regular wide angle, like for 16-35mm lens etc. This flat short port allows the Dyron's M67 wide angle lens, macro lenses and filters to be used underwater. The gate must be mounted in place of the original Ikelite port. Flat short port M67 for the Ikelite housing for Canon G10 / G11 / G12 and Canon SX200 / 210 and Panasonic TZ10. Custodia subacquea Olympus PT-054 per Olympus XZ-2. Questo caso è perfetto per affascinanti fotografie subacquee o per catturare il brivido degli sport acquatici e delle attività. Cappuccio LCD rimovibile per monitor LCD. Entrambi hanno attacco per i flash Sea&Sea. You are looking at a Ikelite Camera Underwater Enclosure Kit, with case & accessories. # 48215. This is a very cool kit! Allows you to take your high tech camera under water for beautiful shots of sea life, without having to buy a cheap water camera! Not sure what type of camera fits in this enclosure. The inside measures about 7.25 x 7.40 inches. Still a great deal! Does show wear from regular use. Previous owner engraved information on case & enclosure and also taped instructions to back. Please see all pics to see accessories included. Get it before that holiday vacation!!! Bid with confidence, check our feedback and know that we guarantee customer satisfaction by offering a full refund if you are not happy with your purchase. Restock fee may apply. 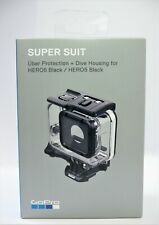 Genuine GoPro Standard Housing for Hero4, Hero3, Hero3+ BRAND NEW! !